Our profit strategies provide existing clients and new customers with strategies and advice to maximises business profit. Most businesses don’t think of their accountant as a true resource for profit maximisation, but understanding the accounting side of your business can have a big impact on your profitability. 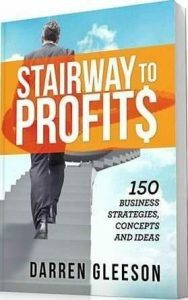 You can purchase our latest book ‘Stairway to Profits’ here which details 150 strategies, concepts and ideas, that if implemented will give you a more profitable, more valuable, and more enjoyable business. These strategies apply irrespective of the type of business you own, the size of the business, or even your level of business experience. Would a Mobile App Benefit Your Business?